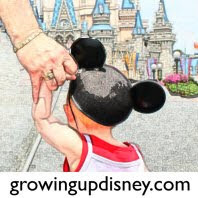 Growing Up Disney: ADRs Made! I love the new online dining reservations system. While you do miss out on some of the fun of telling someone about your trip, it's so much more convenient than calling WDW-DINE. The confirmation emails are really nice. I guess I should do a full post on this sometime and go into the details. The Growing Up Disney team is going to Walt Disney World this October and we'll be blogging throughout the trip. We love the Epcot International Food and Wine Festival. I made some ADRs (advance dining reservations) today for lunches. We'll be dining at Kona Cafe, Yak & Yeti, and Sci-Fi. I'm keeping the plan simple this time to allow for flexibility with Tink and to allow for lots of eating at the festival.